Finally updated the Autumn Twilight campaign log with some long overdue updates. The group is progressing through the Ruins of Warsaw module nicely. I added another stick of 512MB PC2400 RAM. Just for kicks and so I can add a few more tracks on my Cakewalk recording software. 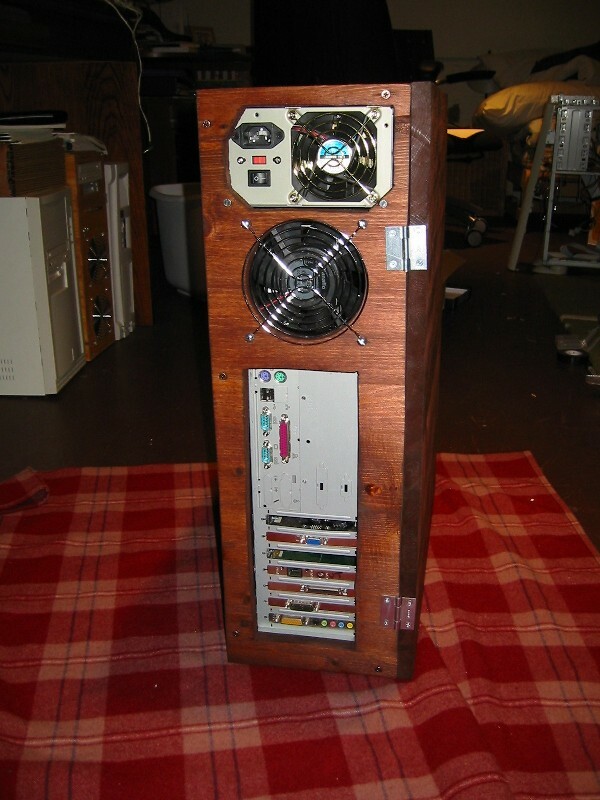 I ended up ditching the DigiDoc 5 and the PCMods baybus since the case would end up being really, really tall and awkward looking. These two devices will probably end up in Headcrash when it gets modded and rebuilt again. I also junked the Flowmaster Max water cooling kit after it popped a leak and dripped on a sick of RAM. I swapped it for a Zalman Copper Cooler and found that it runs at about the same temperatures as the water cooling solution and just as quiet. 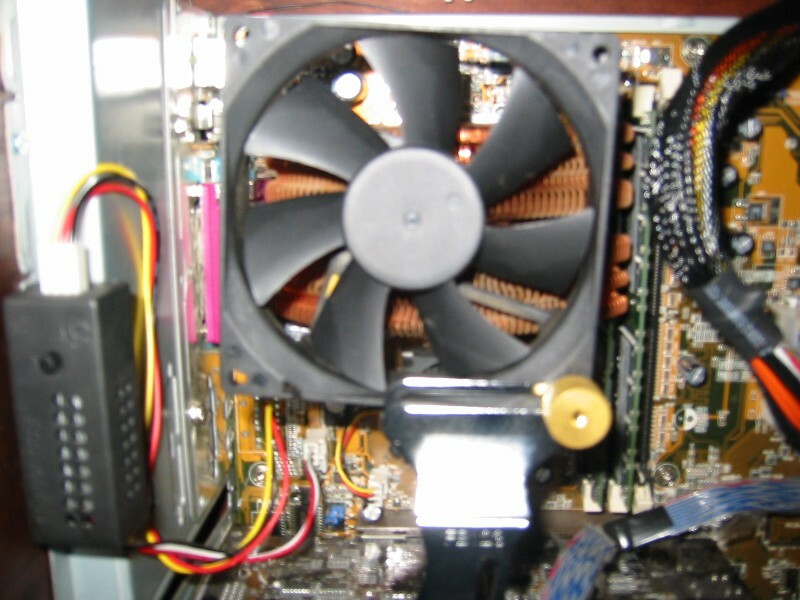 It basically replaced the vibration of the pump motor with a whirring of a 92mm fan. I love this HSF! I guess I just was never really satisfied by the results of the water cooling solution, although it was fun to put together. I do plan on water cooling my next rig, but, now that I know what I’m doing, I’ll buy better components, like a better copper block and a pump with a better flow rate. I’d definitely build a reservoir into the loop to take water expansion into account. I didn’t do that before, so when the water expanded as it warmed up it leaked out through my fill pipe. Earthquake is my primary machine, and I just can’t keep my hands off of it. 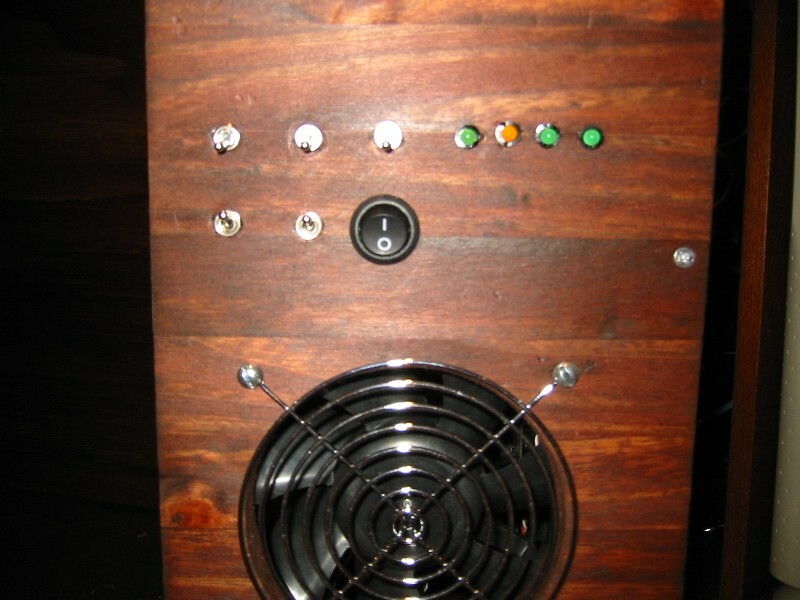 Lately, I’ve had a bug to build it a new case, to replace the rather poorly modded HX08 that currently hosts it. So after building the wood case for Locust I decided to make a new one for Earthquake. 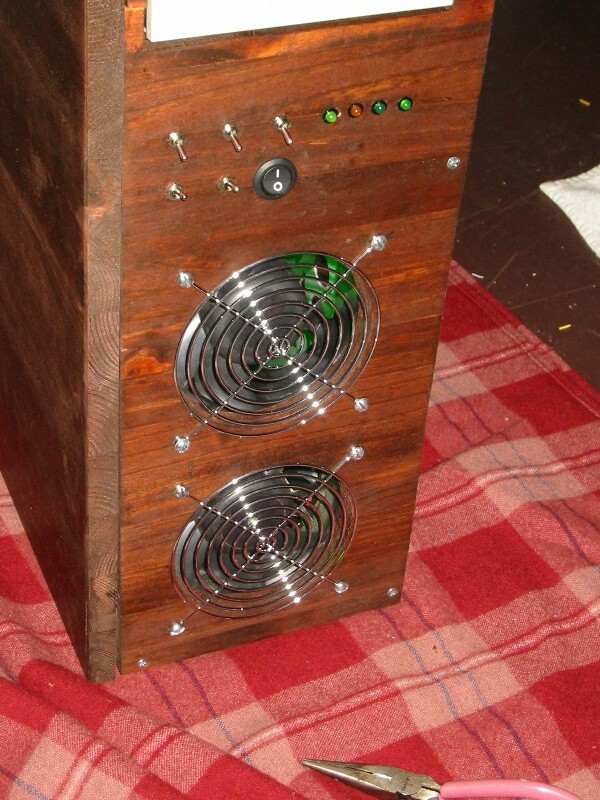 I set about looking at my efforts at building Locust and wanted a case set up along similar lines. I wanted a quiet case that was roomy and matched the rest of my desk furniture. 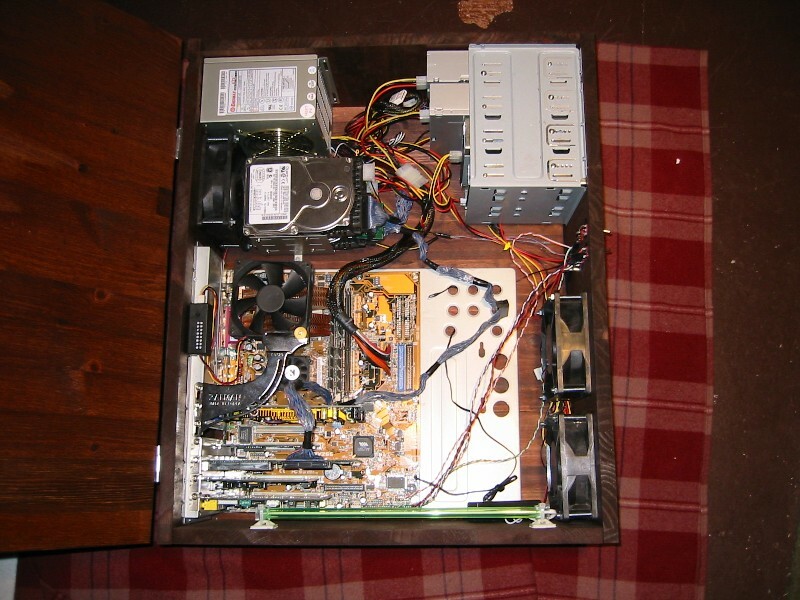 I gutted Earthquake‘s current HX08 for this project, using the motherboard tray and a 5-1/4″ drive bay from a previously gutted case. This would remove the jury-rigging I had to do with locust and would give a more finished look. Tools used included a jigsaw, a Dewalt power drill with a 120mm hole saw and various drill bits including a 1″ drill bit. I also increased my skills with a soldering iron. I used 5/8″ pine laminate which is essentially strips of pine glued and pressed together to form a stripe effect. Thicker slabs of this stuff are found in chopping block tables and counter tops. It makes for a good looking case, and is relatively easy to work with and not all that expensive (about $15 for a 24″ x 48″ piece). The only problem with the laminate is that it tends to crack along its seams while drilling fan holes, so you must be careful about that. I finished off the look with some cherry-tinted stain. I was trying to keep the look as clean and as cooling efficient as possible. I used two 120mm fans for intake down low in the front, and another 120mm fan and fans on the Enermax as outflow fans, creating a slight overpressure in the case, keeping dust from getting sucked into cracks and devices. A close up shot of the fan grilles. 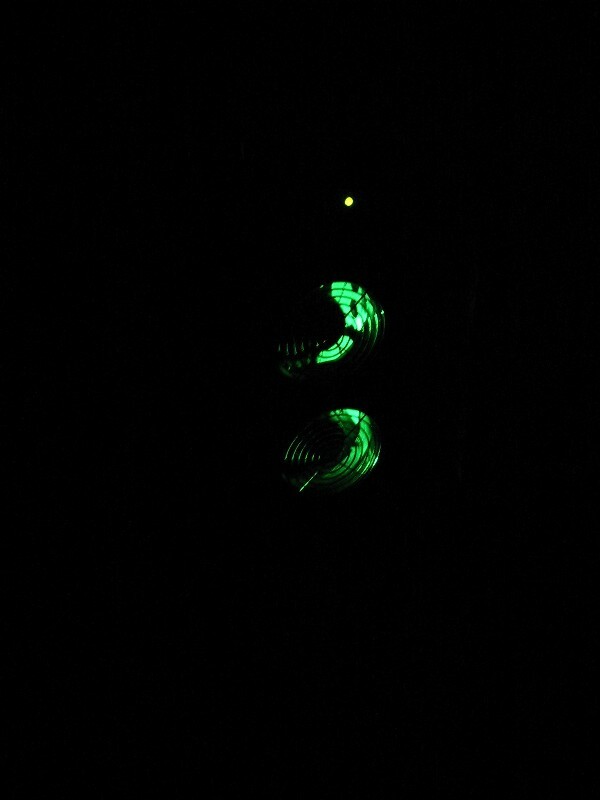 The green metal inside the case is actually the light from the green cold cathode reflecting off of the metal hard drive tray inside. The flash reduced the light quite a bit. 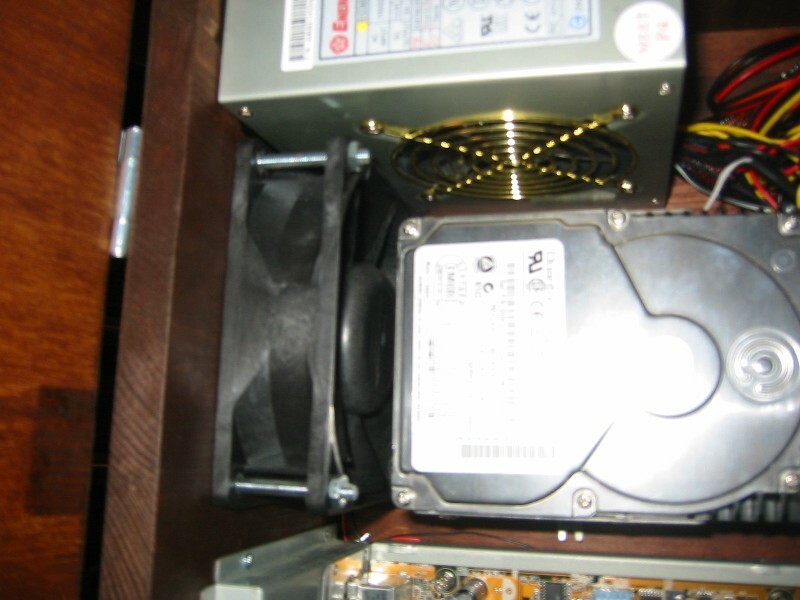 Various detail pics of the dual hard drive configuration and and the interior wiring. What you can’t see in the hard drive picture is the two layers of vibration damping rubber matting I mounted under the drive tray to alleviate some of the drive noise caused by the drive platters spinning at 10,000 rpm. 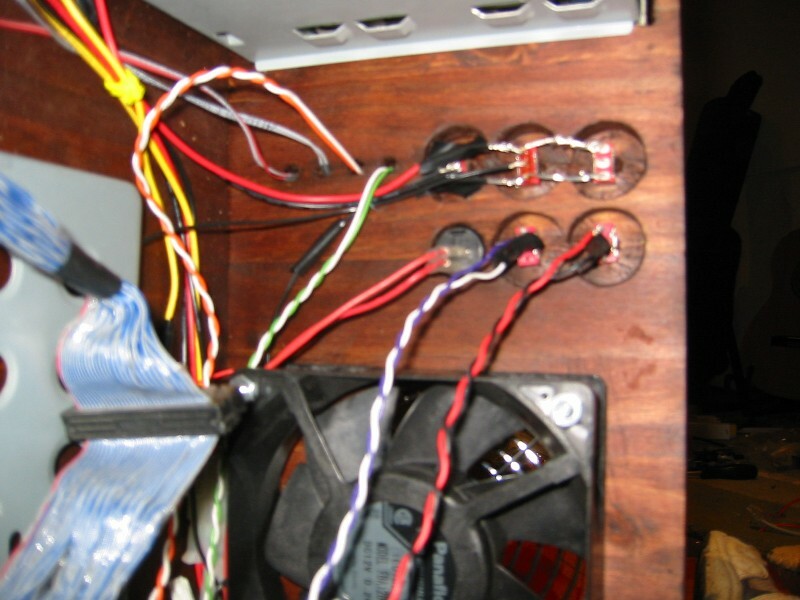 I use five switches: one 12v-5v switch for the 92mm Zalman fan, one 12v-Off-5v for the dual 120mm fans up front, one 12v-Off-5v for the 120mm in the back and two momentary On-(On) switches for Reset and Power. The black switch is the On-Off switch for the Cold Cathode light. 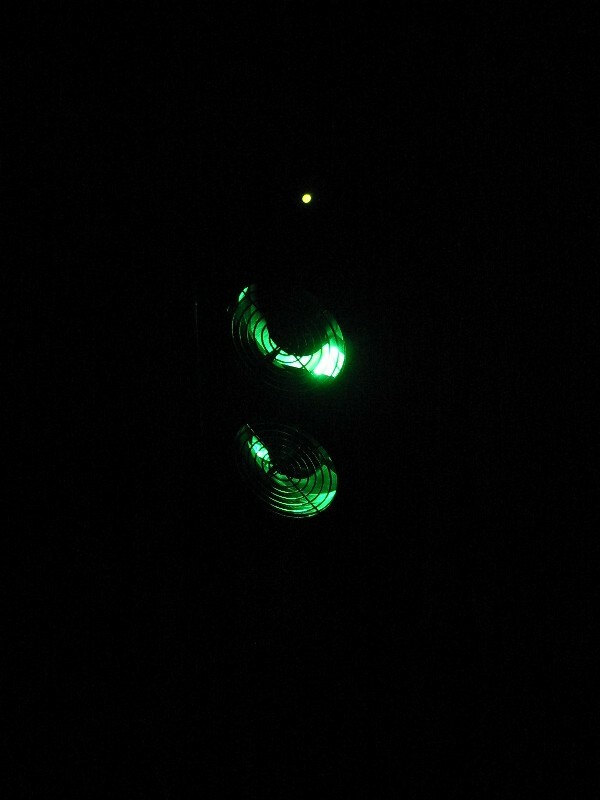 The Four LEDs are for (from left to right) Power, IDE Activity, SCSI HD0 Activity and SCSI HD1 Activity. Here’s a picture of how it looks before spray painting the bezels. 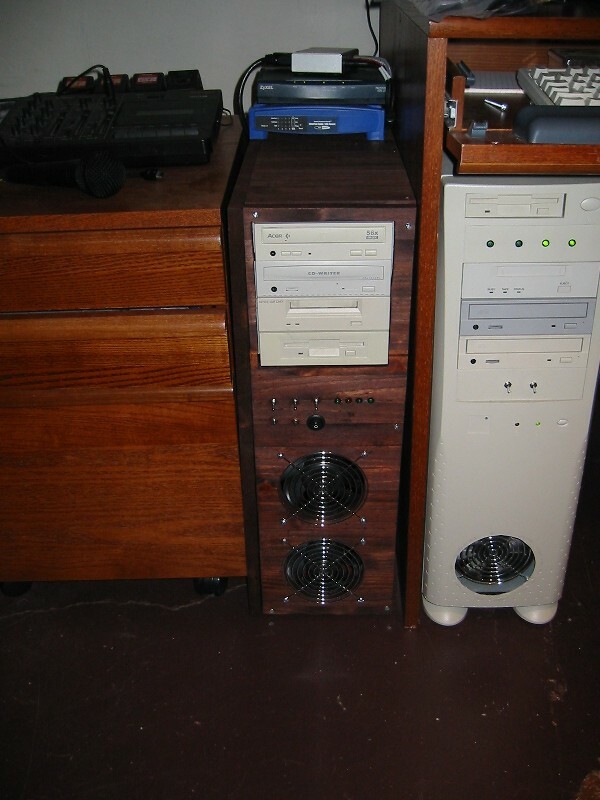 Note the boring beige HX08 that currently hosts Headcrash. It’s days are numbered!